Chianina beef, probably the oldest cattle breed in the world and certainly the largest, is now at all three M’tucci’s locations. “We are fortunate to be New Mexico’s sole provider of this amazing locally raised & pure blooded Italian Chianina Beef. All of the iconic meatballs we serve will now be made with this truly special product. You will also see numerous other Chianina products work their way into our restaurants in coming months. Having the opportunity to serve what’s widely considered “Italian Wagyu” was an obvious choice. We are committed to providing the most authentic Italian experience and products possible. We feel this is another giant step in that direction," said Executive Chef John Haas. Meatballs al Forno at Italian: 4 House made meatballs with roasted marinara, fresh mozzarella, market baguette and roasted garlic. 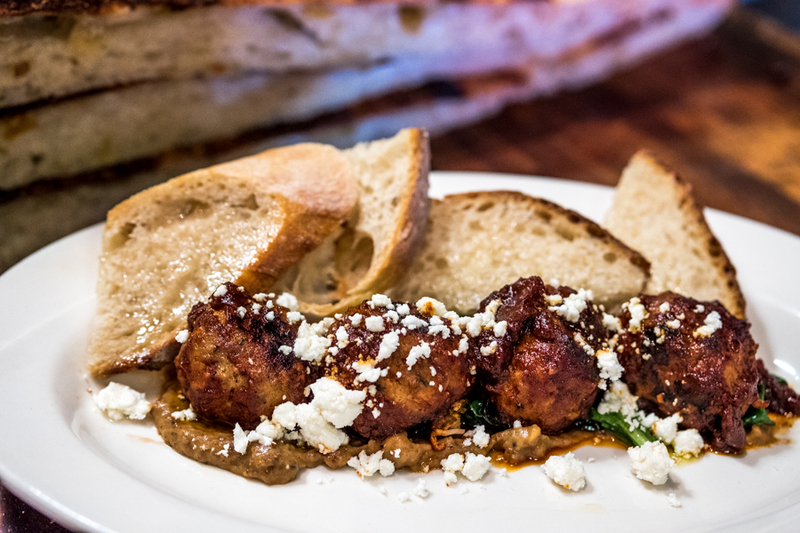 Market & Pizzeria Meatball appetizer: meatballs with tomato agridulce, sautéed spinach, feta, apple chutney and toasted bread. Chianina beef is famous for it’s flavor and nutritional values, and is the largest and tallest breed in the world. Bulls often stand 6 feet tall at the shoulder and can weigh more than 4,000 pounds.. Originating in the Valdichiana in Central Italy, they are most prominent in Tuscany, Umbria and Lazio. Called vitellone (big veal) because of their rapid growth, the meat is lean like veal, but red like beef. The famous thick-cut (2”) porterhouse steaks in Tuscany, bistecca all fiorentina, only use Chianina beef. We hope you will come in soon and see for yourself. We have just tapped a very special release ale at Italian and Moderno, Upslope Brewing’s Sazerac Style Rye Ale and it is fantastic! In a world of interesting and creative craft beers, Upslope has created something very special. This ale pays homage to the classic New Orleans cocktail, featuring bold and delicate flavor in one glass. Upslope partnered with Leopold Bros. Distillery, aging the ale for nine months in Absinthe and Rye Whiskey barrels. Prominent notes of licorice and fennel fill your mouth on the front end, with sweet notes on the finish provided by orange blossom honey. This big, bold ale has an ABV of 10.8, so we limit the pour to 10 oz. Try one on your next visit! We’ve got a few front runners for the April Photo Contest. Don’t forget to share your photos from M’tucci’s on your Facebook page or your Instagram feed and tag them #lovemtuccis. The best photo will be chosen from the three photos with the most likes on April 30. 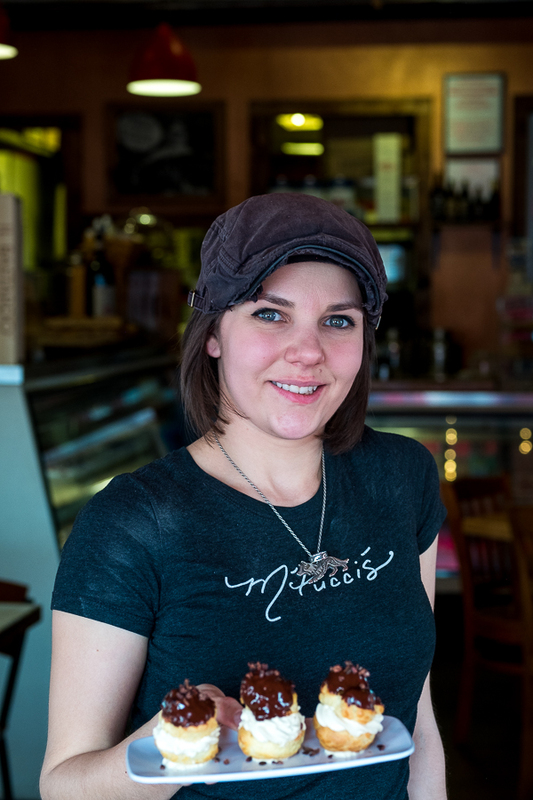 The winner will receive a $50 gift Certificate and have their photo featured on La Gazzetta di M’tucci’s. PHOTOGRAPHER’S TIP: Learn how to edit your photos on your phone, at least for exposure. We have had a few entries that could have been strong contenders, but they are simply too dark. Always edit your photos! The days are getting warmer and the large door in the lounge is being opened on a regular basis. Come in and enjoy the warm afternoons and the sunsets on the Sandias. 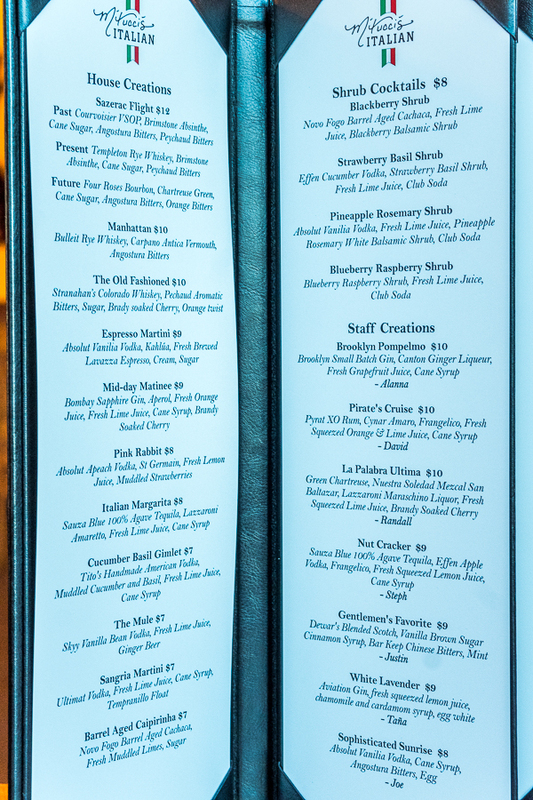 Happy Hour is all night in the bar on Mondays and Shrub drinks are half price on Tuesdays. You can now see videos demonstrating how some of our drinks are made and watch the process for some of our house made products, such as mozzarella. Click here and become a subscriber. Make reservations now for Easter Sunday at Moderno and Italian. We will have a few specials in addition to our regular weekend brunch menu. Watch this Blog for the specials. You can now place your take out order online from our website. Click here for the Italian page and Click the red Online Order button. Call us as you are arriving, park in the Take-Out Parking Space by the front door and we’ll bring your order to you. Curbside service!! For now, this is only available at Italian. Flight of the Four Seasons - Servers and Bartenders Stephanie and Liz created four Tea-Infused Cocktails and Chef Damian paired them with four courses that were a big hit at Italian on Sunday, April 7. Stay tuned to this space for more special dinners and pairings. What kind of dinner would you like to see? Wine Dinner? Craft Beer Dinner? Please subscribe below to receive an email when each new issue of La Gazzeta is published. There is no kitchen ingredient more important than salt. It brings out a food’s natural flavors, it enhances a dish after cooking, we cure meat with it, preserve vegetables with it and use it with cocktails. The only rock that we eat, our bodies require it, civilizations have fought wars over it, and great cities were located near it’s source (Salzburg, Austria). 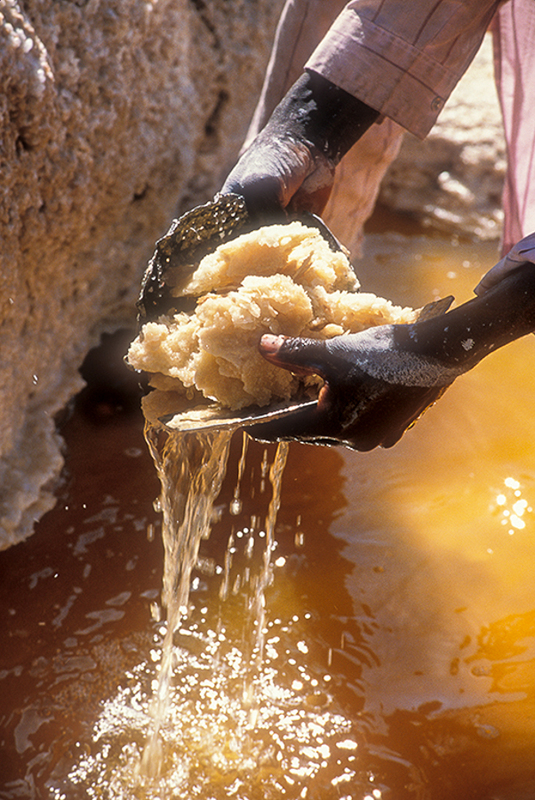 For many years, salt was a valuable trading commodity, even used as currency in some locations. In 1999, I followed the Tuareg people of Niger for three weeks across the Sahara desert while working on a book for National Geographic. They used a camel caravan to transport the salt that is harvested from evaporation pools in the Western Sahara desert. They would buy it in November, store it in their village, then take it to parts of Nigeria to trade in the Spring. All of our chefs agree about its importance, some prefer to use only sea salt and a few like the ease of using Kosher Salt. Kosher salt was originally used in the production of meat in Kosher kitchens and is a course salt, easy to sprinkle with your hands. One brand that you are likely to find in any good kitchen is Diamond Crystal. Chef Cory advises caution when using Kosher salt, because it is easy to over use it. And, once something is too salty, you have to start over. Table salt is rarely used in our kitchens, since it tends to have a stronger salt flavor and is easy to overuse. Sea salt also has the added flavor profiles of other minerals depending on where the evaporation ponds are located. PASTA OR VEGETABLE WATER: Chef Shawn suggests using sea salt in pasta water. How salty should it be? It should taste like the ocean and the only way to determine if you have added enough is to taste the water carefully (don’t burn your tongue!!). Marcella Hazan recommended a minimum of three quarts of water and 1.5 tablespoons of salt per pound of dried pasta, more if the sauce is mild and not salty. If you would like to know more about the origins and uses of salt (making mummies in ancient Egypt), I highly recommend the book, “Salt: A World History” by Mark Kurlansky. April Prix Fixe Menu will be posted on Instagram and Facebook page Wednesday morning. Three courses paired with three wines for $25 per person. April 7, 4:00 - Flight of the Four Seasons: Four-Course dinner paired with tea-infused cocktails at M’Tucci’s Italian. Space is limited, reservations required - $55 per person (service not included). Please call 505-503-7327 for reservations. Here is a video of the making of the first cocktail on the list, the Spring Fling. Monthly Photo Contest - Win a $50 Gift Certificate! Post a photo from M’tucci’s on your Facebook page or on your Instagram feed and use the hashtag #lovemtuccis. 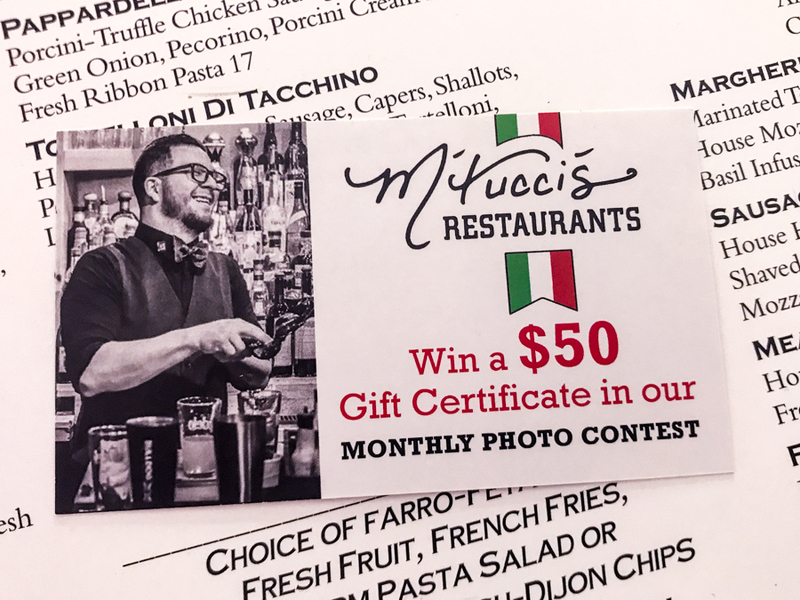 On the last day of the month, we’ll pick the best photo from the three photos with the most engagements (likes, shares and comments) and the winner will receive a $50 M’tucci’s gift certificate. Each month’s winner will be entered in the annual contest for the Grand Prize (tbd). Photos are being posted now for the April contest which ends on the last day of the month. Winners announced on May 2. Also, check out Facebook or Instagram on Thursdays for the Thursday Night Prix Fixe Menu. Now online is the M’tucci’s You Tube Channel. See highlights of our three locations, watch the kitchen in action, and watch our talented pros make cocktails that they have created. Watch it here. For daily specials, Follow us on Facebook, Twitter and Instagram. Click on the icons at the bottom of the page. To receive an email when each new Newsletter is published, you can subscribe at the bottom left of the page.